Filipinos abroad can now trade their old bills for New Design Series (NDS) Bills according to the Bangko Sentral ng Pilipinas (BSP) as they increase the allowable maximum amount. In a statement released by the monetary board, it was approved last September 8 to let overseas workers exchange from Php 10000 up to Php 50 000. It was first announced that the old bills introduced in 1985 will lose its monetary value in January 2017 to be succeeded by New Generation Currency (NGC) that was propelled in 2010. BSP advice Filipinos abroad who wants to apply for NDS Banknote Exchange Facility must register their banknote holdings on their official website https://orbs.bsp.gov.ph from Oct. 1 till Dec. 31, 2016. Once they are registered within the date mentioned, they have at least a year to give their original passport and the printed confirmation notice at any BSP office to process their NDS Exchange. Meanwhile, overseas workers who are located at countries undergoing geopolitical crisis throughout the registration period can present their original passport with an exit stamp by authorities from war-weary countries or has an exit points for reinstatements at any BSP Office to prepare from Jan 1 till Dec 31, 2017 with Php 50000 limit for each overseas workers. The central bank will examine each verified NDS Banknotes that will be acknowledged for exchange. 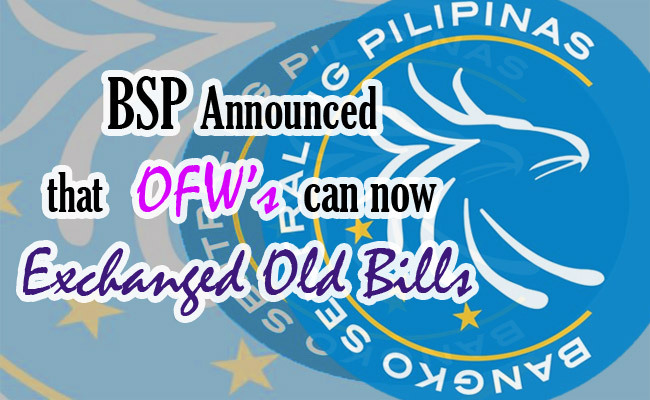 Starting next year, old banknotes will not be receive for any transactions or exchange at BSP Offices as they will not have monetary value. They also want to inform Filipinos abroad that the banknotes release in 2010 will continue as a legal tender in the Philippines from 2017 onwards. Overseas workers who want to inquire can visit BSP’s help desk at CIIOhelpdesk@bsp.gov.ph. This will be great news for OFWs who failed to exchange their old bills for New Generation Currency.